When my mind finally cracks, and after they come and take me away in a rather challenging strapped jacket, I like to think that someone might look through my various blog posts to try to spot the moment when the Great Collapse actually began. I think perhaps they may pause over this post and decide that this, indeed, is it. … people in my floor. We have a cork floor in our bathroom. Old fashioned, I know, and not very Glam but it’s warm underfoot and I like the retro nostalgia of it. I’m also far too lazy to do anything as proactive as replace them with newer, brighter, tiles. I’m all about the Status Quo, me. 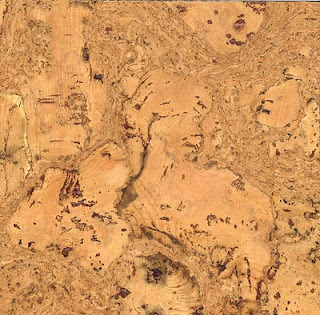 I’ve been looking at these cork tiles for over ten years now. Well, I say ‘looking’… they have existed as part of my life without being in any way remarkable or engaging. Then, one morning, while shaving, on the periphery of my sleepy vision, there, on the floor, reflected in my steamy mirror, a face emerged from the cork floor tiles. And ‘emerged’ is exactly the right word. We are not talking here about a two dimensional cloud-like illusion of human characteristic. Laws no, this was a rounded, recognisable face, somewhat smaller than full-size, lifting itself wearily from the intricate weavings of the cork. I swung round to look directly at the thing but whatever angles in the mirror had created the apparition no longer applied when inspected full on. There was no face, only flat cork tiles - a bit dated but, like I said, warm underfoot. Back I went to the mirror, replicating the previous angle as best I could and, no, still no face. A silly sleepy illusion, not possible to retrieve. But it started me off on something, I think. Subconsciously, I must have engaged myself in looking for faces in the cork tiles on my bathroom floor. Over subsequent weeks and months, my eyes must have slipped into scanning the surface, trying to find another friend hiding there. There are many, many faces in my cork floor. Some are flat and distant, some are bold and lift right up out of the ground as you study them. It amuses me to seek them out and bring them to life for a few minutes before letting them slip back down into the world below. Sometimes it unnerves me a bit too. Who are they, these people in my floor. Are they the souls of people who died on this spot in ages past, finding a crack into this world via the chaotic perception of a natural pattern? Are they a reflection of a stain on the surface of my brain? Are they… anything at all? I have always felt that bathrooms are an optimum place to go mad. Have you ever been a little bit pissed, in a bar or night-club, and have you ever retired to a toilet cubicle to at least collect yourself. Have you found, once the toilet cubicle door is closed, how much drunker and incapable you suddenly feel and, when you emerge again, how recomposed you become. There is something about being behind a secure door that encourages a person’s madness to blossom. Locked in with yourself, on your own (apart from the faces in the floor) there can be a moment to drop the defences, to let the insanity leak in. Someday, perhaps, it will not leak back out. Enough with this Flight of Fancy. Of course I know what they are really, these faces in my floor. You need not worry about me and my friends in the bathroom for, deep down I totally know the truth. The faces are nothing to be afraid of, neither are they a cause for any concern about my mental health. Not at all. Quite the opposite, I think. They are, simply, my Imagination. One of my very best assets, I think. Have a look at the photo which goes with this post. I can see people in there – not just one or two but lots of them. That’s good. I can still make up something out of nothing, just like I have always seemed able to do. ...my bathroom buddies and me. I’m not sure I could count the number of ideas that I’ve had in bathrooms, literary ideas I mean. Not baths. I’ve never found bathing inspiring. And I’ve never been one to sit on the loo and read the daily paper either. In fact I have a very utilitarian view of bathrooms in general: you spend as little time in there as you need to do whatever business you need to do and that’s that and yet, however you want to describe it – the eye of the storm or an Oasis (if you can name rock groups then why can’t I?) – that break from the norm has frequently given me moments of clarity that have gone on to turn themselves into lines in poems or entire stories. I also see faces in the carpet but I’ve never, at least not yet, seen a face that’s worked its way into a work of fiction. Well I hope I have the padded cell next to yours. :) At first glance I only saw a woman's face, but when I looked again, there were more. I'm going with the we-just-have-fertile-imaginations approach as opposed to too-much-time-in-the-bathroom theory. Then again, in the header on my blog I saw what was a small foot in that cracked mud. Yesterday I found the original photo...and it's just mud, not a real footprint (mine) like I thought. My first thought, when I saw the photo, realized it was your bathroom floor, and you were concerned about being put away, was, "Why would anyone put you away for that? LOOK at all the faces there." What made me nervous was the thought that you might feel this was a bad thing, but I relaxed by the end. May we ALL have padded cells with computers and internet access, so we may enjoy one another's "insanity" with abandon. Loved this post. I used to have a thing about dancing curtains... but a lot of that was drug-related. I used to stare at the moon out of my bedroom window when very young. I found if I stared long enough the man in the moon would start singing. I too see faces in trees, fabrics etc and have passed the madness onto my children. There was a FANTASTIC article about this in one of the various science magazines I read not too long ago. Apparently, we are wired to very rapidly analyze and recognize faces, which is of great social value of course, but also results in many of us seeing faces everywhere. There was actually a TV ad not long ago that played off this principle, but of course now I can't remember what it might have been for. Hope: I hope you have the padded cell next to mine too, we could tap little messages to each other. Alison: I've had good feedback to the drunk in the toilet aspect of this piece. I am glad to not be alone in this foible. Jeanette: The pic isn't actually my floor, it's cleaner than mine. :) But it is indicative of the people who reside in cork flooring in general. Bella7: I stared at the moon in 1969 and swore I could see my namesake walking there. Well you certainly have imaginative toilet visits haha, you are not alone in quiet madness, I would stare at the artex swirls on plastered ceilings as a child and see shapes as you might in clouds, I also would lay on my back and imagine walking on the ceiling and stepping over doorways. I think when the mind is at ease and quiet the imagination runs riot, we are conditioned to recognise faces in unlikely places so its no surprise people find Jesus in a piece of toast or other religious figures in random places and mishapen vegetables that resemble phallic symbols. Either way it makes looking at the floor more fun and if you find a perverse carrot it raises a laugh (oh the immaturity of it all). Though it would be a great idea trying to send someone mad by shaping faces in everyday objects if you really wanted to drive someone insane haha. Potential evil genius there. As long as you dont start hearing voices telling you to go carving redrum in listed buildings doorways all is well. Keep looking and someday there may just be a winning lotto ticket someone dropped and only you notice. Those floor people can't be unseen, either. I'd have to have the floor re-done; can't have all those people in the bathroom with me. Really fun post; love your writing style.